Are Americans among the most religious people in the world? The answer depends on which "world" you're talking about. If you're referring to the entire planet, the answer is plainly "no." 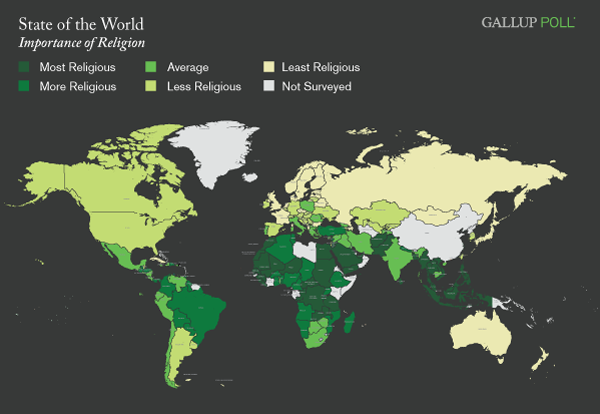 In 2006, 2007, and 2008, Gallup asked representative samples in 143 countries and territories whether religion was an important part of their daily lives. The accompanying map shows religiosity by country, ranging from the least religious to the most religious on a relative basis. Across all populations, the median proportion of residents who said religion is important in their daily lives is 82%. Americans fall well below this midpoint, at 65%. But before you point out the considerable effect religion has on U.S. society and politics, let's change the lens to account for a basic insight multicountry surveys offer: a population's religiosity level is strongly related to its average standard of living. Gallup's World Poll, for example, indicates that 8 of the 11 countries in which almost all residents (at least 98%) say religion is important in their daily lives are poorer nations in sub-Saharan Africa and Asia. Social scientists have noted that one thing that makes Americans distinctive is our high level of religiosity relative to other rich-world populations. Among 27 countries commonly seen as part of the developed world, the median proportion of those who say religion is important in their daily lives is just 38%. From this perspective, the fact that two-thirds of Americans respond this way makes us look extremely devout. What's more, as Gallup's Frank Newport recently pointed out, there is wide regional variation in religiosity across the 50 American states. The proportion of those who say religion is important in their daily lives is highest in Mississippi, at 85% -- a figure that is slightly higher than the worldwide median (among all countries, rich and poor). Two others, Alabama (82%) and South Carolina (80%) are on par with the worldwide median. Lining up these percentages with those on our worldwide list allows us to match residents of the most religious states to the global populations with which they are similar in terms of religiosity. The results produce some interesting comparisons -- Alabamians, for example, are about as likely as Iranians to say religion is an important part or their lives. Georgians in the United States are about as religious as Georgians in the Caucasus region. On the less religious end of the spectrum, residents of New Hampshire look similar to their neighbors in Canada and Alaskans are about as religious as Israelis. Obviously, these data only compare the importance of religion in people's lives -- they say nothing about what being highly religious means in different parts of the world and among different faiths. Nonetheless, it's fascinating to note that in terms of religiosity, Americans span a range that invites comparisons to some predominantly Muslim countries in the Middle East and tribal societies in Southern Africa, as well as to some relatively secular nations in Europe and developed East Asia. Examining regional variations within many other large countries would almost certainly uncover similar diversity. Recognition of that fact should give Americans pause when we're tempted to apply blanket generalizations to other cultures; for example, to say residents in those nations are less devout or more prone to zealotry than people in America. It should also help those outside the United States avoid applying such oversimplified judgments to Americans. For U.S. state-level religiosity data, results are based on telephone interviews with 355,334 national adults, aged 18 and older, conducted in 2008 as part of Gallup Poll Daily tracking. The margin of sampling error for most states is ±1 percentage point, but is as high as ±4 percentage points for the District of Columbia, Wyoming, and North Dakota. Interviews are conducted with respondents on landline telephones (for respondents with a landline telephone) and cellular phones (for respondents who are cell phone only).